Are you thinking about running some usability tests on your digital product? Are you unsure where to start? Then today's books (yep two for the price of one) are for you. 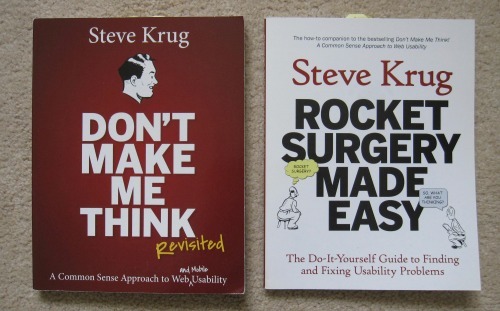 I would suggest starting with Don't Make Me Think and if you found that useful try Rocket Surgery Made Easy both by Steve Krug. He has deliberately kept both books short and to the point, making them quick reads but full of useful information. There is a little overlap between the two but I felt this just reinforced the principals. What I really like is that both books are full of practical advice. He explains exactly how to do a test including how to find people to test with. He gives you scripts to modify and use, along with checklists to use in the build up to, and during, the test. "Usability tests do not have to be in some swanky lab with two way glass and cameras hidden all round the room"
He explains who to invite to watch your testing and why. He suggests equipment setups using bits and bobs you might already have in the office or can get from Amazon. Usability tests do not have to be in some swanky lab with two way glass and cameras hidden all round the room, although that would be nice. Krug suggests that you should spend a morning a month testing and you probably do not need more than three testers each time. This keeps it simple and will give you plenty to work on until the next session. These books are nicely written, in an easy to read style, but full of understanding of how it really is out there. I found myself nodding my head in agreement on more than one occasion as he described issues I have experienced. But he also offers ways to work round these issues and suggests arguments to back up what you are trying to do - make your product better. If you want to try running usability tests on your products these books are a great way to start, making it feel like an easy thing to do, rather than an overwhelming scary thing. Plus he has even more resources on his website if you need them.